Those people who want to flag irrelevant answers as NAA because they aren't actually answering the question (answer is using different language than original question or is just completely off topic). Those people who argue that if you look at it literally, it is answering the question by the mere fact that it is an answer and not a question, comment, or follow up. This was posted as an answer however it should possibly be an edit, comment, another question or deleted altogether. This was posted as an answer but does not address the original question. Obviously, the descriptions can be amended to be worded better, hence this has been tagged as a discussion too. To get to the US Capitol Building from the Pentagon, enter the Pentagon station of the Washington Metro (subway) which is just outside the main entrance. Get on a Blue Line train to Largo Town Center. Ride the train until it reaches Federal Center SW, then get off. Walk north on 3rd St SW until you get to Independence Ave SW. Walk east until you reach the US Capitol building, which will be on your left. I've been active on the site for a year and a half, and I've seen my fair share of questions (and answers). Most of the situations I've needed to flag an answer that wasn't a NAA answer, it was either to report spam, or an abusive user. I don't think I've come across a situation where neither the spam, the rude/abusive, nor the custom flag was not appropriate. Can you think of some situations where this flag would come of use? What would the protocol be for handling them? Should flagged answers be sent to one of the review queues? Or should moderators handle it? I've seen quite a bit and I understand different people have different definitions of what an "off-topic" question (or answer) is. Can we guarantee that the wordage describing the flag is clearly interpretable enough to prevent people from accidentally abusing it? I don't think this flag should become a reality unless we can answer all the questions above with 100% certainty. I cautiously support the idea. My biggest concern is that these flags should be directed to those who know the topic well. Perhaps, we should only allow reviewers who have subject knowledge of the tag the ability to review these flags. I think we could put this on a trial run and allow users with silver or gold badges in the respective tags to review these. It can require 4 recommend deletion and/or delete votes to fall in line with LQP - but with gold badge holders votes counting as two. "What happens if the answer is in a low traffic tag???" The answer is simple: nothing. The answer will just do what every other answer has done to date, remain on the question and the flag will just expire. If this is implemented, the queue shouldn't suffer from the same issues as it always has, which would be vague recommendations as how to handle the post. Triage for the longest time had recommendations that placed a lot more questions into the "Requires Editing" category then there should have been. Only delete answers that are blatantly wrong and add zero value to the question. If 80% of the answer is wrong - it needs to be downvoted, not removed. 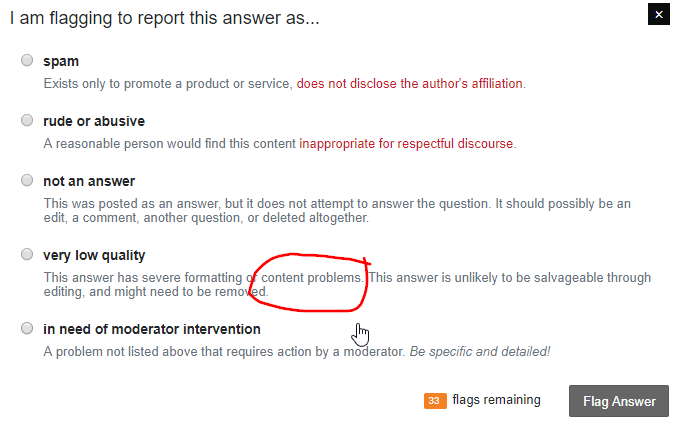 If we want to allow flagging answers for deletion because they're irrelevant to the specific question that was asked, the mods should just start acting on NAA flags on such answers. The problem is that at the moment we have a NAA flag description that unambiguously says that it's appropriate to use NAA flags for answers that don't attempt to answer THE question that was asked (which is precisely what you want your new flag to cover), but guidance from staff that actually we should act like the NAA flag means something significantly different to what it says. Adding another flag that looks to a new reader like it's strictly a subset of NAA doesn't fix this situation; we first need to bring the NAA description and the completely contradictory official interpretation of it into alignment with each other. I am not sure that I understand the issue you want to solve. IMHO, regular SO users do not have difficulties with flags on theirs answers, just because there is message that advice how to improve it. Regular SO users have difficulties asking questions - but this is a different story. 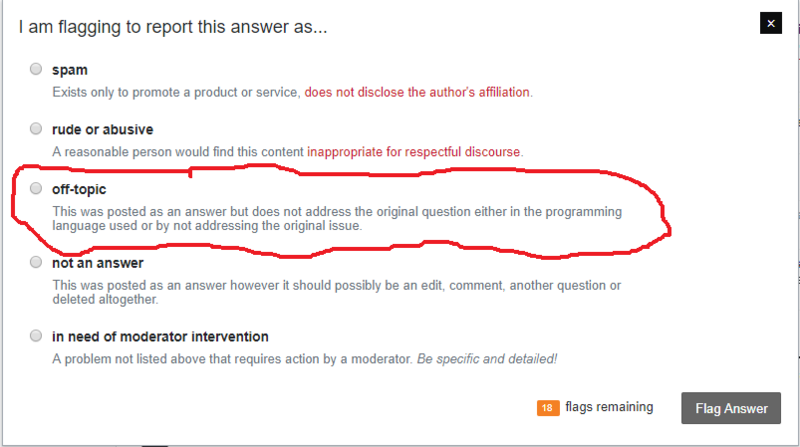 So I guess you are trying to help "new reviewers", you want to make 'not an answer' more intuitive for them. And when I agree that SO 'not an answer' is not intuitive, more complex menu would just mystify "new reviewers" additionally. Goal is not achieved. Whole menu should be "remastered" if there is a goal to achieve better UX. Is the off-topic answer to off-topic question “not an answer”?